With the rapidly accelerating digitalization and automation of the ITS domain, the urgency to ensure consistency on the information level becomes more and more obvious. The more or less linear world of ITS is transforming into a world in which all actors exchange information with each other because the roles of data collectors, data processors and information providers are increasingly being combined for each actor in the value chain. The 5th DATEX II Forum was a great success! Read more about The 5th DATEX II Forum was a great success! n the 23rd and 24th of May the 5th DATEX II Forum was held in the LEF Future Meeting Center in Utrecht, the Netherlands. 143 participants from 20 different countries came together to learn more about the standard, to exchange knowledge with the rest of the community and to enter into discussions about the future. Read more about D2Light App Launch! In many countries the need for a detailed information model is recognised and properly reflected by DATEX II. 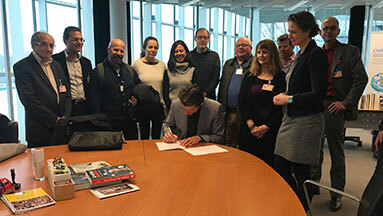 the DATEX II PSA Cooperation Agreement was signed for the maintenance and further development of DATEX II for the provision of interoperable Intelligent Transport Systems and Services for road transport.